The indices include weightings of equities, bonds, real estate "cash" and “alternative” investments in proportions that reflect the longer-term objectives for each strategy. The weightings are determined by the WMA Private Indices Committee, which is responsible for regularly surveying WMA members and reflecting in each index the industry’s collective view for each strategy objective. The index weightings are updated when the Committee determines that strategy changes across the industry warrant a review. The result is a suite of indices that can be used as benchmarks to compare the performance of portfolios that have investment objectives similar to the strategy represented in the respective index. 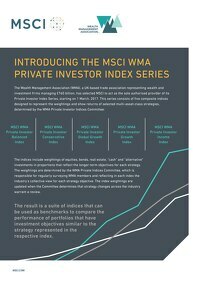 Read the latest press release - 'New MSCI WMA Private Investor Index Series now live'. To contact an MSCI representative to discuss your index data requirements. View all Exchange Traded Products, including ETFs, ETNs, Futures and Options, linked to MSCI indexes. MSCI ACWI Indexes offer a modern, seamless, and fully integrated approach to measuring the full equity opportunity set with no gaps or overlaps.